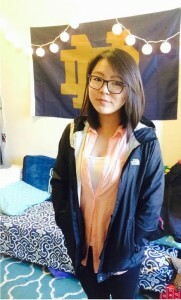 I am a rising sophomore at the University of Notre Dame, double majoring in Business (Marketing) and Chinese. Though I’ve lived most my life in Seattle, I’m a Korean-American born in the Midwest. Besides studying for my courses at Notre Dame, I’m also involved in Asian American Association, Korean Student Association, Project Fresh (a hip hop dance club), and SIBC. This summer I will be spending 8 weeks in Beijing, immersing myself in Chinese language and culture—an experience I can’t wait for! My SLA Grant is important to me because it allows me to attend Notre Dame’s Summer Language Abroad program in Beijing, to not only improve my Chinese language skills, but also experience first-hand the culture, society, and traditions. Being able to study the Chinese language in China itself is a major stepping-stone on my path of my goal to achieve fluency in Chinese. I want to become fluent in Chinese not only because of my personal interest in Chinese language and culture (the Chinese language has many ties to the Korean language, and learning about these connections has made my learning experience all the more exciting), but also because I am a business major—China plays such a major role in international business and trade. Basically, the SLA Grant is important to me because it allows me to attend a highly valuable program that will exponentially improve my Chinese language skills and knowledge of Chinese culture, valuable for me in my future career and life experiences. Currently, I am fluent in English and Korean, so I believe that learning Chinese is a valuable skill to have as an Asian American pursuing a business career. As a result of the Summer Language Abroad in Beijing program, I hope to experience a fruitful summer filled with improved Chinese language skills, meeting new people of diverse backgrounds, and insight into Chinese culture. I have set an ambitious goal for myself for this summer to become at least fairly conversationally fluent in Chinese—in other words, to be able to converse comfortable and casually with native speakers with good pronunciation. The SLA grant has allowed me to turn my plans for a fruitful summer into reality, one step closer to reaching my ambitious goals in Chinese language study. Immersing myself in the country’s culture, language, and society for eight weeks will be a valuable milestone on my path to becoming fluent in Chinese. In addition to improved language skills, I hope to meet new Chinese friends with whom I can consistently speak or write to in Chinese, experience Chinese culture and society firsthand, and, most importantly, strengthen my desire to achieve fluency in Chinese. By the end of the summer, I will be able to confidently speak, read, and write Chinese at a level where I can take Third-Year Chinese this fall semester. By the end of the summer, I will be able to maintain a casual conversation in Chinese with native speakers on a variety of topics. By the end of the summer, I will be able to speak with greatly improved pronunciation, and my improved speaking skills will allow me to navigate my way through Chinese society without having to rely on a native Chinese to translate for me. By the end of the summer, I will be able to share my experiences and everything I’ve learned about Chinese culture and society. I plan to take full advantage of my international language study by taking this experience beyond just the language improvement aspect to immersing myself in the country’s culture and society for the entire eight weeks. The Beijing program provides many cultural excursions and lectures, as well as the chance for Notre Dame students to practice language speaking with native Chinese students. In addition to these aspects of the program, I plan to speak only Chinese to the best of my ability, so that I am constantly practicing my Chinese. This combination of cultural exposure and language study is what particularly attracted me to this summer program, and I plan to experience this to the fullest. As a Korean-American who has frequently visited Korea, I understand the immense of value of immersing oneself in the country’s society and keeping in contact with fluent speakers. I hope to meet many new Chinese friends with whom I may keep in contact—conversing in Chinese, of course. After my summer abroad, I plan to continue my studies and achieve a major in Chinese, with the goals of fluency and in-depth knowledge of Chinese language and culture. 你好! (Hello!) It’s been a week since I’ve arrived in Beijing, China, and I’ve already had a lot of new experiences, all eye-opening and culturally awakening. Since we’re literally on the other side of the world, in an entirely different country and culture, this first week has been filled with a lot of adjustments in terms of jet lag, food, school campus, living quarters, and especially language. Ever since the first day of our Chinese language classes at Peking University, we’ve signed our language pledge and have been adapting to only using our not-quite-so-fluent Chinese to converse with teachers, roommates, and amongst ourselves. We’ve dived straight into intensive, fast-paced coursework, so our days during the week have mostly been filled with studying Chinese (as well as exploring the amazing food variety at Peking University’s cafeterias). However, during the weekend, we travelled to one of the most famous historical sites of China: The Great Wall. The trip to the Great Wall was a fantastic way to end what has been a very busy week of figuring out life in a new country as a foreign student. Although the weather was intensely hot, the view from the top of the Great Wall was definitely worth the hike. I can’t wait to see the other beautiful sites China has to offer. After this second week in Beijing, I’ve adjusted more to life here and have gotten familiar with not only Peking University’s campus, but also the neighborhood around our dormitories just outside the East Gate of the university. During the week, I’ve gotten familiar with the pace of our coursework and homework load, as well as the lifestyle of Beijing. For example, I’m enjoying delicious Chinese food everyday, as well as never forgetting to bring toilet paper with me to the bathroom (as there aren’t any available in bathrooms in China). Going to the local marts, finding and purchasing everyday necessities and snacks while using Chinese to ask questions has become an familiar activity. During the weekend, several friends and I explored the streets of Beijing, using our Chinese to ask local people how to find the nearest shopping mall (which turned out to be just a quick 15-20 minute walk down the street. There, we explored the very modernized shopping mall with its many floors as well as ordered delicious food, speaking in Chinese of course. One of the best parts about living in Beijing is that the food, even if it is at a restaurant at a mall, is extremely inexpensive. Next week is a short week in terms of classes, but that’s because we have a trip to Hangzhou and Shanghai scheduled. I’m extremely looking forward to this chance to experience other Chinese cities! We’ve just come back from our 5-day trip to Hangzhou and Shanghai, and already I have twice as many pictures from these cities than I do from Beijing. With this blog post, I’m going to focus on our trip, since our classes this week were short. We travelled from Beijing to Hangzhou on an overnight train (a long 13-14 hour trip, but we spent most of the time sleeping – after enjoying the view of Beijing from our train of course). Although we were tired from the train ride when we arrived in the morning in Hangzhou, there was definitely no time to be tired as we had so much to see and experience. In Hangzhou, we got to visit a huge company and its factories, as well as eat a fantastic feast of delicious Chinese and Hangzhou cuisine for dinner. However, my favorite part of Hangzhou was definitely Xihu (West Lake). Because it was raining, we only got to see the lake for a few minutes on our way to our restaurant, I thought the lake was even more beautiful because the rain led to a beautiful misty fog on the lake. In Shanghai, we got to visit a variety of beautiful, traditional sites, such as Jade Buddha Temple and Yu Garden. The architecture, the statues, the garden were all so intricate and beautiful. In addition, in Shanghai, we once again filled our bellies with feasts of Chinese cuisine. I’ve never seen so many different dishes and tasted so many different but delicious tastes at one sitting before. Overall, this trip to Hangzhou and Shanghai has been a trip to remember, leaving me wishing we could’ve stayed a bit longer and explored more of these cities. However, we’ve come to China to learn Chinese, so I’ll update this blog later with more of experiences in Beijing and improving my Chinese. Already, I’m halfway through my Chinese program here at Peking University, and have experienced even more of Chinese culture. For one, I’ve learned that tea culture in China is very prevalent and diverse, and I’ve been able to further experience this culture when we visited a teahouse in Beijing this past weekend. There, we not only drank some wonderful traditional tea, brewed with tea leaves in the actual teacup, but also enjoyed various traditional Chinese performances, such as the famous Beijing opera (known for the high-pitched tone of the performers’ songs) and several acrobatic acts. Another popular tradition one cannot forget when visiting Beijing is the famous Peking Duck dish, which is particularly famous among tourists. Recently, when we had dinner together with a visiting Notre Dame professor, along with other delicious Chinese dishes, we got a taste of Peking Duck. This is Beijing’s famous, iconic dish, known for its extremely thin yet crisp skin. After finding out more about this dish, I learned that this famous dish, originating from the imperial era, is prepared by glazing, drying, then roasting a duck. Then, it is typically served in very thin slices, and eaten with vegetables, such as cucumbers, and sweet bean sauce. They are all wrapped in a thin pancake, and traditionally eaten by hand. This delicious dish has definitely risen in ranks on my list of most favorite food. This past weekend, my friends and I explored The Old Summer Palace in Beijing (a.k.a. YuanMingYuan or 圆明园), and one of the first things I noticed as I entered its gates was that China has the most beautiful lotuses I’ve ever seen. Inside YuanMingYuan, there are a lot of lakes, all filled with lotuses to the extent that you can barely see the water. The northern end of this historical site even had several ruins of ancient, western-style, stone buildings. It was fascinating to see the western influence present inside this ancient, traditional Chinese cultural site. Another aspect of our trip to YuanMingYuan that peaked my interest was that there were a lot of Chinese tourists, to the extent that I rarely saw any foreign tourists within this historical site. This was most likely due to the fact that it is currently summer break here in China, so many families were traveling and visiting cultural sites together. This got me thinking about Chinese holidays, since China is such a large country with people often traveling from city to city. Recently, our class lecture mentioned a popular Chinese holiday, possibly one of China’s most famous holidays: the Spring Festival (春节), or more commonly known as Chinese New Year. After asking my teachers about this event, I found out that this is a holiday centered around family; everyone returns home for this holiday and reunites with family, since many people move to large cities away from home for jobs. In fact, because so many people travel home during this time, people have to buy train tickets very early, otherwise tickets sell out. I asked a tour guide about this event as well, and learned that, as well as the importance of family reunion for this holiday, there are also many, popular, well-known activities and symbols associated with this holiday. For example, families often decorate their homes with red paper-cuts of symbolic Chinese characters (such as ones signifying “good fortune”, “good luck”, “happiness”, etc. ), light firecrackers during celebrations, as well as give money in red envelopes. Every week here in Beijing brings new experiences, and I can’t believe there are only two weeks left of this study abroad program. I have realized how much my Chinese language skills have grown (which I particularly noticed when I was successfully able to bargain with vendors at markets in Beijing for lowering prices of souvenirs I wanted to buy). Although I do miss American food and my family, I know that there are also many parts of living in Beijing that I will miss as well, so I plan to fill my last two weeks here with as many experiences as possible. Already, this past weekend was my last weekend here in Beijing. So, of course, my friends and I tried to fit in as many experiences as we could for this past weekend, and I’d say that we were pretty successful in doing so. We not only visited the must-see historical sites such as Tiananmen Square and Forbidden City, we also made stop by Wangfujing and Summer Palace as well. This past weekend was definitely fruitful in that we experienced everything from traditional Chinese architecture and gardens to the fascinating food market at Wangfujing (which had numerous food stands offering all kinds of large insects, small reptiles, and even seahorses on shish kebab sticks for sale). In addition to the numerous historical experiences, I also learned more about Chinese society—specifically how minorities are treated in China. As an Asian American, I’ve noticed that foreigners are welcomed very graciously by Chinese people, but usually this welcome is initially displayed towards noticeably foreign visitors. For example, this past weekend, my friends and I were mistaken as native Chinese people, and our inability to fully understand the driver’s very quick Chinese led to a situation where the driver kept raising his voice, probably wondering why we didn’t understand what he was saying. As soon as we explained in our beginner Chinese that we were foreigners his attitude became much more friendly, and finally let us get on the bus. Following up on this experience, I met and discussed with other study abroad students (not from ND, and staying long-term in Beijing) on this topic, and they commented on how the local Chinese people were very curious about foreigners and very welcoming. In fact, quite often, non-Asian foreigners would be asked by strangers to take pictures with them, which can seem strange from a foreigner’s perspective. However, in my opinion, this just shows the extent to which Chinese people are very open to learning about foreign culture and sharing their own culture. Already, the last week of classes have passed, and today is my last day here in Beijing. I have mixed feelings in that I miss my family and can’t wait to share with them my experiences in person, but I also have gotten used to living here at Peking University, and enjoy my classes and teachers. We took our final test this morning, and celebrated our “graduation” from this program with all of our teachers with a delicious Chinese-style lunch banquet (which is essentially a lot of various Chinese dishes on a circular table with the turning glass top). Having learned about Chinese cuisine culture, I now know that Chinese people place great importance on having grand meals with many people, as this is a great way to take time to converse and spend time with others. If I had to choose one part of this summer experience besides visiting Chinese historical sites that I will miss the most, I would definitely say that I will miss the local teachers who taught us here in Beijing. Particularly, I will miss the 1-on-1 sessions we had everyday with them, where we essentially got to converse with each other (using Chinese of course to practice speaking), often discussing topics about the similarities and differences between China and the U.S. For example, one recent topic one of the teachers and I had was on the topic of education, and how Chinese students had to study hard for one huge college entrance exam, while U.S. students had the opportunity to also pursue all kinds of extracurricular activities even throughout high school. My teacher thought that the U.S. education was great in this sense, and hopes that Chinese education can start to shift in this direction rather than just focusing on academics. Objectively speaking, I’ve noticed that Chinese people’s impression of the U.S. is that it is a very open-minded country, and appreciates such openness, which often isn’t available in certain aspects of Chinese society. However, the Chinese people still expressed much pride for their country, which I admire. Overall, I can’t believe that 8 weeks have already passed and that I will be on a plane tomorrow leaving China. This has been the most fruitful experience I’ve had. I’ve not only greatly improved my Chinese, but also grown to understand and appreciate Chinese culture more than ever. This past summer in Beijing, China has been a very rewarding experience not only in terms of my Chinese language learning, but also in getting to know a different culture. Culturally, I learned much more about modern Chinese society, through first-hand experiences in the streets of Beijing as well as various lectures and interactions with our teachers. Our program in Beijing was highly intensive, especially since we’ve technically fit a year-long study into just 8 weeks, but I now understand that I would not have been able to successfully learn so much material in such little time had I not actually been in China. Because I was exposed to the language every hour of the day and speaking Chinese every time I talked even with my friends, my Chinese language skills have been able to grow immensely. I believe that I have been able to meet my language learning goals for this program—I was able to travel around Beijing individually without any trouble, asking for directions when needed, and I even learned how to successfully bargain with street vendors using Chinese. Overall, my experience abroad in China has taught me more about Chinese culture and society than I have in any classroom setting back at home. For example, I’ve learned that Chinese society puts much emphasis on hospitality and treating others, and that definitely shows in the traditional Chinese cuisine; a traditional Chinese meal consists of an endless variety of dishes on a rotating table, and it is normal for one person to pay for the entire, grand meal as a treat for the other people. Life in a Chinese city is very busy and loud, always bustling with people and sights to see on every street corner, whether it be a small street vendor or a large, modern shopping mall. I’ve learned that one has to go to the actual country to truly understand the lifestyle and culture of that country. I would definitely recommend, especially for foreign language learners, to go abroad and take language classes in the native country. Not only does one’s foreign language skills improve immensely due to the fact one speaks that language on a daily basis, but also one can truly get to know that country’s culture and social atmosphere, and further understand differences and similarities between different countries’ cultures. I plan to continue learning Chinese, hopefully improving my language skills to the point where I can easily converse with a native speaker. Now that I’ve experienced life in China, I understand much more of the differences between culture and etiquette between China and the U.S., which I believe will greatly help me in my career goals of working in the international business field. I know that I will continue to study Chinese language, so that I may be able to use it in my career, as well as in my social life getting to know more people of diverse backgrounds.